This volume brings together academics, executives and practitioners to provide readers with an extensive and authoritative overview of the classical music industry. The central practices, theories and debates that empower and regulate the industry are explored through the lens of classical music-making, business, and associated spheres such as politics, education, media and copyright. The Classical Music Industry maps the industry's key networks, principles and practices across such sectors as recording, live, management and marketing: essentially, how the cultural and economic practice of classical music is kept mobile and alive. The book examining pathways to professionalism, traditional and new forms of engagement, and the consequences of related issues—ethics, prestige, gender and class—for anyone aspiring to 'make it' in the industry today. 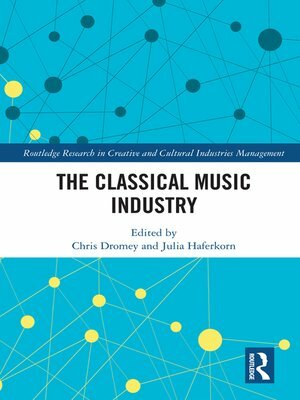 The first volume of its kind, The Classical Music Industry is a significant point of reference and piece of critical scholarship, written for the benefit of practitioners, music-lovers, students and scholars alike offering a balanced and rigorous account of the manifold ways in which the industry operates.